Charlie Savage of the New York Times reports in “Senators Wrestle With Updating Law Authorizing War on Terrorist Groups” that: “Asked at a luncheon on Monday at the National Press Club in Washington what legal basis the United States had to attack Syrian government forces, the chairman of the Joint Chiefs of Staff, Gen. Joseph F. Dunford Jr., claimed the authority stemmed from the 2001 law because the American military presence in Syria was predicated on fighting Al Qaeda and the Islamic State there. Boyle is professor of international law at the University of Illinois College of Law. He said today: “What the U.S. government is getting away with here is incredible. 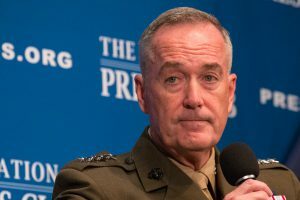 Gen. Dunford is citing the 2001 AUMF to go after Al Qaeda as justification to go after a secular government — Syria — that is actually fighting Al Qaeda, as well as ISIS.